Presentation entitled “Developing the Economic Model for Success” from day 2 of the American Medical Group Association’s Accountable Care Organization Learning Collaborative, at the Swissotel in Chicago. Attended by approximately 60 leaders of AMGA member physician organizations and other interested parties. Explaining alternative types of ACO structures: How do Co-Management arrangements and Hospitalists fit in? All across the country, physicians and hospitals are talking to each other about creating new organizational structures to enable them to work together more effectively. Some are trying to create Accountable Care Organizations (ACOs) or Organized Systems of Care (OSCs) to participate in the Medicare Shared Savings Program or similar programs being launched by commercial health plans. Others are motivated by a desire to accomplish specific goals, such as improving transitions of care or trying to get surgical procedures to start on time. Any organizational structure represents a trade-off between different “dimensions” that are competing for attention. For example, in a car company, it may be helpful to have one part of the company focus on the European market, while others focuses on North America, Asia, etc. Alternatively, it would be good for one part to focus on products that are sporty, while other parts focus on luxury, economy and utility. Or, one part can focus on marketing and communications, while other parts focus on research & development, manufacturing, and finance. Whenever one dimension is selected to be the basis for organizational structure, the other dimensions are not selected. The lack of consistency and focus in the non-selected dimensions often becomes a problem for the company. Those problems become the justification for the next reorganization of the company. Clinical Department: Surgery vs. Medicine vs. Pediatrics vs. Psychiatry vs. Dermatology vs. etc. Service Lines: Heart & Vascular vs. Bone & Joint vs. Fetal & Maternal vs. Cancer vs. Pediatrics vs. End Stage Renal vs. Hospice vs. etc. The structure of a local health system cannot be based on all of these dimensions at the same time. Different local markets have different structures. Over the last two decades, the typical structures of local health systems have shifted. Continued shifting is anticipated. During the 1980s and 1990s, various “health system” and “staff model HMO” structures were established, and many physician practices were acquired by hospitals and other large entities. 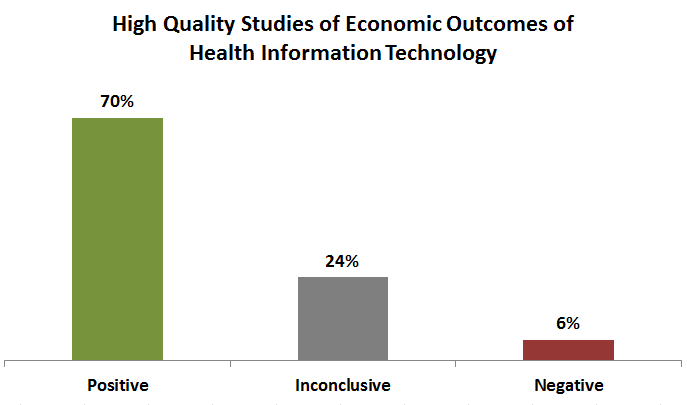 But, after the managed care back-lash of the late 1990s, the degree of integration decreased. 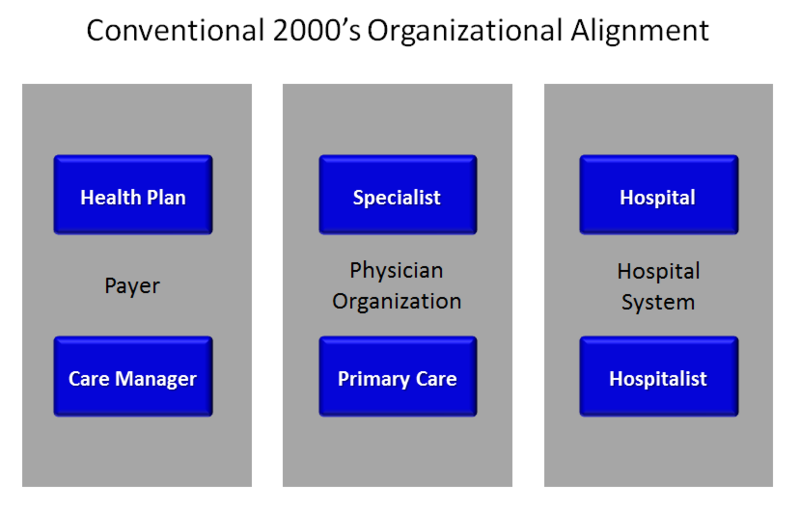 In the conventional organizational alignment in the 2000’s, the payer function was separated from providers, and physician providers were separated from hospitals. Health plans hired their own care managers or contracted with care management vendors in an attempt to improve health outcomes and reduce cost (or at least to appear to do so). Primary care physicians and specialists formed various types of physician organizations such as multi-specialty group practices and independent physician associations (IPAs). Hospitals hired their own hospitalists to coordinate hospital services and reduce length of stay under prospective payment. In anticipation of health care reform, and in particular the Medicare Shared Savings Program, hospitals are initiating the formation of Accountable Care Organizations (ACOs). Such organizations integrate physicians and hospitals. They also intend to include care managers as part of the ACO, rather than relying on health plan-based care managers. 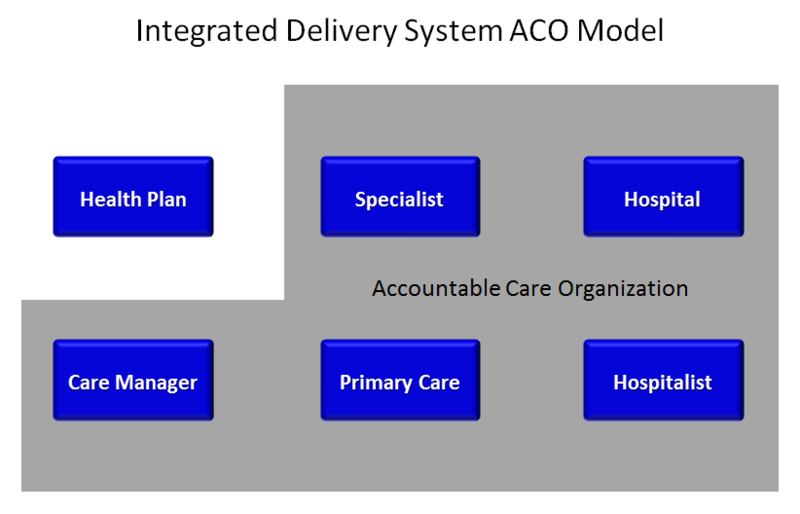 I call this the “integrated delivery system ACO Model.” It resembles the health systems of the 1980s and 1990s, with the exclusion of the payer function. They desire to avoid “insurance risk” while retaining “performance risk” — although I am deeply skeptical that these two components of variance can be meaningfully separated. This integrated delivery system ACO model offers the theoretical advantages of alignment of incentives of primary care physicians, specialists and hospitals — all focused on managing the care of a defined population of patients to improve quality and reduce overall population cost. However, there are a number of important barriers to this model. First, in many medium and large communities, there are more than one hospital organization and more than one physician organization, and there is a many-to-many relationship between them. If a hospital organization convenes an ACO, they must either accept the divided loyalty of the associated physicians or they must disrupt the referral relationships to cleanly separate “their” physicians from those of competing ACOs. If many primary care physicians continue their association with multiple hospital-based ACOs, then it becomes difficult for any one ACO to make significant investments in primary care practice-based care management staff, clinical information technology, and practice transformation coaching. 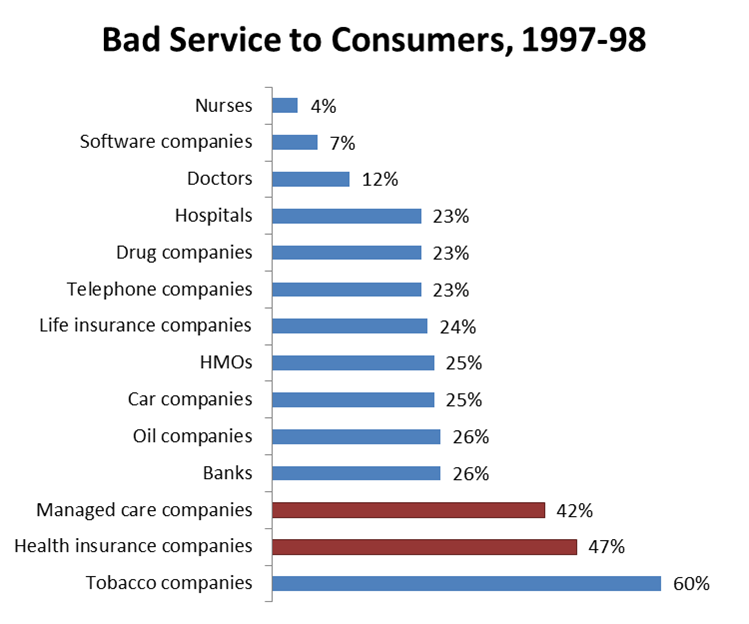 Each ACO fears that their competitors will have a “free ride” on their investments. If hospital leaders in a community attempt to solve this problem by creating a single large ACO for the community, they threaten the competitiveness of the local health care market and risk attracting the ire of the Federal Trade Commission and other anti-trust regulators. 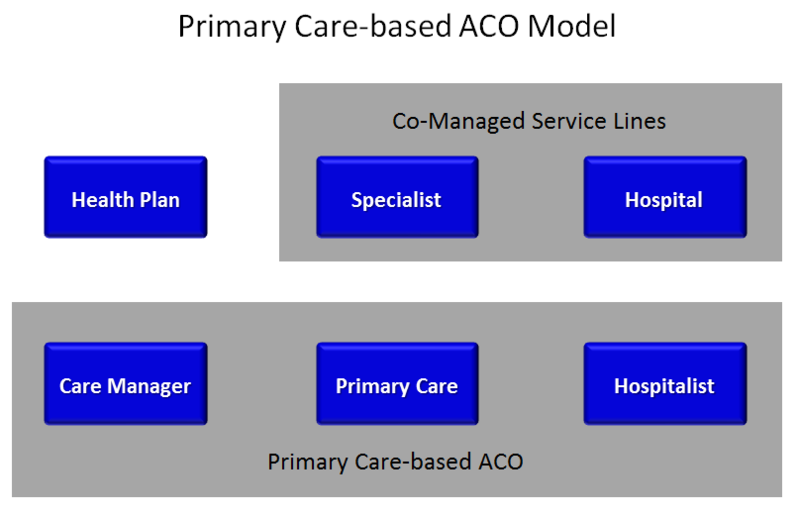 An alternative model for ACO formation is the “primary care-based ACO” model. Under this model, primary care physician organizations come together to convene the ACO, such that all of the patients of participating primary care practice units constitute the ACO’s defined population. The draft regulations for the Medicare Shared Savings Plan define the ACO population this way, although it is obviously limited to only the Medicare patients. In this primary care-based ACO model, the ACO has an easier time achieving critical mass and avoiding free-rider problems with their investments in practice-based care managers, clinical information technology, and practice transformation coaching. In such as model, specialists and hospitals become cost centers to the primary care-based ACO. Such specialists and hospitals will continue to provide services to patients from multiple ACOs. In this sense, hospitals and specialists are on the periphery of the ACO, rather than at the center of it. Of course, the diagram above is an over-simplification because it lumps all specialists together. In fact, as shown in the figure below, the optimal alignment of specialists depends on the focus of their practice. Traditionally, “PARE” providers (pathology, anethesiology, radiology and emergency) are closely affiliated with hospitals. In addition, specialists with practices that focus on inpatient care and procedures have a stronger natural alignment with hospital organizations. Such providers include surgeons, interventional cardiologists, and critical care physicians. On the other hand, internal medical sub-specialists with practices that focus on evaluation and management services for chronic diseases may find themselves more naturally aligned with primary care-based ACOs. As the “patient-centered medical home” (PCMH) model takes root, and the primary care base of the U.S. health care system is gradually restored, it is recognized that there will not be enough primary care physicians to play that expanded role. The supply of mid-level practitioners (nurse practitioners and physician assistants) will also be insufficient to fill the gap. Therefore, I feel that the logical answer is for primary care-based ACOs to engage chronic disease-oriented internal medical sub-specialists to play the role of clinical leaders of some PCMH practices emphasizing the care of patients with those chronic diseases. Many sub-specialists have been advocating for the right to be considered PCMH providers. Unfortunately, in the draft rules for the Medicare Shared Savings Programs, such sub-specialists were not included in the criteria for physicians eligible to have “attributed” patients in that program, seemingly coming down on the other side of this debate. So, how does “Service Line Co-Management” fit in? As described in a recent article in the AMA online publication, many hospitals are entering into co-management arrangements with specialists associated with their key service lines. Under co-management, the specialists and the hospital form and co-own a separate limited liability company (LLC) which is assigned the responsibility to accomplish specified goals for the service line and to generally contribute to improved clinical quality or efficiency of services delivered in that service line. Such an arrangement must be set up and managed carefully, so as not to run afoul of rules against kickbacks for hospital referrals. Co-management LLCs are not ACOs, since they are not intended to take responsibility for a defined population of patients. But, they can serve as a first step to building trust between physicians and hospitals in preparation for the formation of an integrated delivery system ACO model. 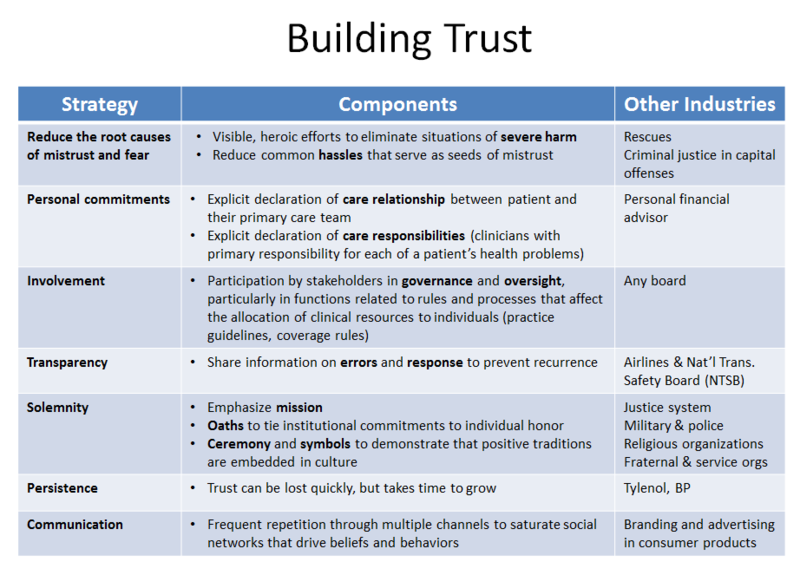 For hospitals desiring to convene such ACOs without the benefit of a long track record of effective physician collaboration, I highly recommend consideration of the co-management model as a way to “get some points on the board.” The more focused co-management arrangements are on specific, achievable and measurable goals, the more successful they will be and the better they will serve this trust-building function. In the context of a primary care-based ACO model, a hospital-specialist service line co-management entity may play a more interesting long term role. If primary care-based ACOs view such service lines as cost centers, and if such ACOs have multiple hospital partners that are competing against each other, the co-management entity can potentially become the vehicle for value-based contracts with the ACO, delivering a winning combination of clinical quality and population-level efficiency to assure the success of both the hospital and specialist partners. Therefore, service line co-management can be a great first step, regardless of whether the eventual ACO model in the community ends up as an integrated-delivery system ACO model or a primary care-based ACO model. In a primary care-based ACO model, the ACO may be motivated to “reel in” the hospitalist function in order to get the benefits of smoother transitions of care and to encourage stewardship of inpatient and specialist resources as needed to manage overall population health care cost. Of course, hospitals will not easily give up the control of the hospitalist function that they typically enjoy. Hospitals need the hospitalists to be focused on their objectives of reducing length of stay and increasing “keepage” (or reducing “leakage”) of specialty and ancillary services referrals to competing hospitals or specialists. I anticipate a tug-of-war between hospitals and primary care-based ACOs over alignment with hospitalists. I would consider the degree of alignment with hospitalists to be a measure of the intensity and sincerity of a primary care-based ACOs’ efforts to manage population cost. The next few years will be an interesting time to be a hospitalist. On March 23, 2011, Trent Haywood, MD, JD, and Keith Kosel, PhD, MBA published the results in the New England Journal of Medicine (NEJM) web site of a financial model of a hypothetical Accountable Care Organization (ACO). 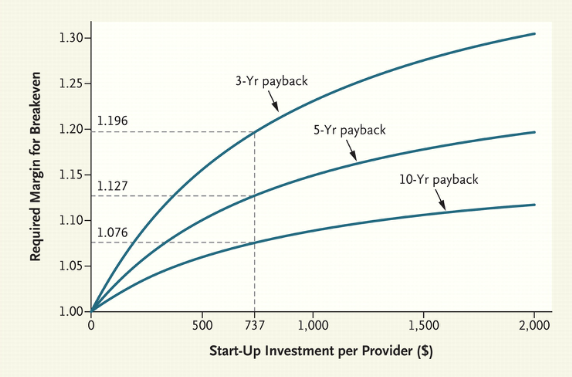 This model shows that ACOs are likely to lose money on the Medicare Shared Savings Program called for in the Patient Protection and Affordable Care Act during the first three years of implementing the ACO model, based on the up-front investment expected to be required. The authors conclude that “the high up-front investments make the model a poor fit for most physician group practices.” They call for modifications to the Medicare Shared Savings Program to make it more generous to participating ACOs. The model is based on assumptions derived from data from the Physician Group Practice (PGP) Demonstration, carried out by CMS from 2005 to 2010. In the PGP, the average up-front investment by participants was $1.7M, or $737 per primary care physician (PCP). The authors calculate that an “unlikely” 20% margin would be required to break even during the 3-year time frame of the Medicare Shared Savings Program scheduled to start in 2012. Haywood and Kosel are to be commended for taking the time to develop a financial model and publish results. I think that such models are extremely helpful to real-world decision-makers because they force people to be explicit about the assumptions they are making, and they provide some quantitative estimates of the outcomes relevant to the comparison of available alternatives so people can make better choices. Unfortunately, in my opinion, the authors misconceptualized the model, creating a risk that people will use the negative results of the model to justify inaction, to their own detriment. 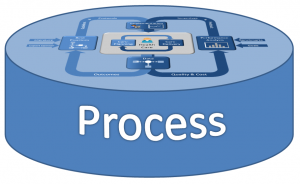 Although this basic process seems simple and straight-forward, experienced analysts know that each of these steps is devilishly difficult. In the case of Haywood and Kosel’s financial analysis, in my opinion, they ran into trouble with the first two steps; they failed to identify the available alternatives and misconceptualized the choice or decision that the model is designed to support, and therefore failed to recognize non-Medicare outcomes that differ across the available alternatives. Of course, an error in any particular step cascades to the remaining steps. Haywood and Kosel did not explicitly explain the decision their model was intended to support. But, one could infer from the conclusion that among the intended decisions they were supporting was the decision by physician organizations whether or not to make a $737 per PCP up-front investment and then sign-up for the optional Medicare Shared Savings Program in order to reap a return in the form of increased Medicare revenue. But, the up-front investment required to create a successful ACO takes the form of fundamental transformation of care processes and the organizational structures, human resources, information systems, and cultural changes required to support them. Such fundamental transformations affect the entire population served by the nascent ACO, not just Medicare patients. And, they don’t just affect the providers’ relationship with payers, they also affect the providers’ competitive standing with respect to other providers and their relationship with other stakeholders such as employers, state and federal legislators, accreditation organizations, etc. The correct conceptualization of the decision facing provider organizations right now is a choice between (1) getting started now with ACO-type transformation or (2) waiting until later to decide if such a transformation is necessary. Physicians and hospitals that are contemplating the formation of ACOs would be wise to invest in the creation of a model to make explicit estimates of all the relevant financial and non-financial outcomes for the available alternatives. Such a model will, by necessity, include many assumptions not supported by solid data. That’s not the fault of a model, nor a reason to justify making decisions based only an intuition (what David Eddy calls “global subjective judgement”). Rather, prudent health care leaders will invest the time to create and use a model to really understand the sensitivity of the results to various assumptions and the dynamics of the outcomes (how outcomes are likely to play out over time). My prediction is that, when properly conceptualized as a “start transformation now” vs. “put transformation off until later” decision, such a model is likely to show what personal retirement planning models always show — it pays to get started on things that take a long time to achieve. If you fall too far behind competitors, you may be unable to catch up later. On the other hand, if provider organizations opt to get started on transformation, obviously there are many smaller decisions that need to be made, such as which care processes to start on, which particular payer-specific deals to cut, which IT investments to prioritize, etc. One last point: Although “pay back period” can sometimes be a useful summary measure of a financial analysis, my advice to to avoid over-simplifying the reporting of model results by reducing it down to a single summary measure. Model authors would serve decision-makers better by presenting a table with their estimates of all the relevant outcomes for all the alternatives being considered, and possibly showing when those results occur over time. Then, decision-makers can understand the drivers of their decisions and subsequently summarize the results in various ways that communicate their thinking most effectively using various summary measures such as net present value, return-on-investment, internal rate of return, pay-back period, cost per quality-adjusted life-year, cost-benefit ratio, etc. I’m not sure about the background of this video submitted to YouTube by Centura Health. But, it is hilarious and sad at the same time. I’ve shown it to dozens of people, and it circulated widely among physician organizations in Michigan.